Fairly typical approach here from TfL. Anything that makes a route shorter, regardless of the impact of passengers, is deemed to be good above all else. The real issue here is the scale of development in and around Hackney Wick is such that a new bus route should really be put into the area rather than removing a well established routeing to create another one. The other surprise is the apparent existence of two stops on Marshgate Lane (or Loop Road if you believe Google Maps). These stops do not register in TfL's route listings for the 339 nor do they show up on LVF either. I assume there are dolly stops but these are not evident anywhere - Google Streetview is a year out of date. I only happen to know this from investigating a possible route to an event this week in Dace Road. Being able to alight on Marshgate Lane and just walk across a bridge would be ideal as all the other public transport options involve a long walk from rail or bus stops. Another consultation for the 339! On all the journeys I have taken on the 339 through this affected area, I have seen very few people get on/off at these affected stops that are proposed for closure. On this section of the route most journeys are through journeys from my observations. Of the new routing I think two stops northbound on Monier Road is a little over generous. I agree with snoggle, a new route through Hackney Wick is due with the increase in development there. Instead of extending the 241 pointlessly to Here East it should go to Hackney Wick Eastway via Waterden Road(or Carpenters Road once that reopens), Clarnico Lane, White Post Lane, Rothbury Road, Chapman Road. I like that idea for extending the 241. Of course, TfL seem happier to keep rendering it ever more useless instead. 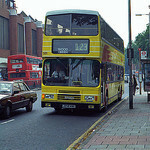 +1 Like the idea for the 241 it really needs to serve a purpose especially when its cut back to Custom House.